Allotment of Plot—No allotment can be made by Improvement Trust without granting opportunity to public at large to compete for allotment. Comments Off on Allotment of Plot—No allotment can be made by Improvement Trust without granting opportunity to public at large to compete for allotment. Auction Sale—Acceptance of Bid—A wrong decision on facts is not necessarily an incorrect decision in law. Comments Off on Auction Sale—Acceptance of Bid—A wrong decision on facts is not necessarily an incorrect decision in law. Resumption of Site—Show cause notice—Notice issued for recovery of dues and imposing of penalty cannot be constructed as notice for resumption of site. Comments Off on Resumption of Site—Show cause notice—Notice issued for recovery of dues and imposing of penalty cannot be constructed as notice for resumption of site. Haryana Urban Development (Disposal of Land and Buildings) Registration 1978– Allotment of Plot-Refund of Earnest Money-Petitioner found not eligible allotment-Petitioner had not concealed the facts and has not given wrong or incorrect Information-Petitioner held entitled to refund of earnest money. Comments Off on Haryana Urban Development (Disposal of Land and Buildings) Registration 1978– Allotment of Plot-Refund of Earnest Money-Petitioner found not eligible allotment-Petitioner had not concealed the facts and has not given wrong or incorrect Information-Petitioner held entitled to refund of earnest money. Surrender of Plot—It is not mandatory for authorities to forfeit 10% of the consideration as stipulated in Letter of Allotment. Section 45(3} itself confers the discretion upon the Estate Officer to forfeit an amount less than 10 percent. 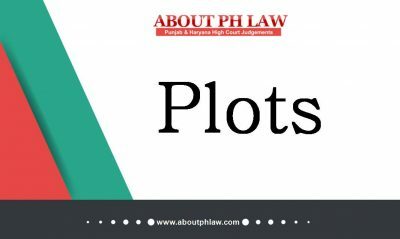 Comments Off on Surrender of Plot—It is not mandatory for authorities to forfeit 10% of the consideration as stipulated in Letter of Allotment. Section 45(3} itself confers the discretion upon the Estate Officer to forfeit an amount less than 10 percent. Allotment of Plot—Nominee of allotee—Cooperative Society has no option whatsoever, except to transfer the membership in the name of the nominee-That, would have no relevance to the issue of title between the inheritors or successors to the property of the deceased. Comments Off on Allotment of Plot—Nominee of allotee—Cooperative Society has no option whatsoever, except to transfer the membership in the name of the nominee-That, would have no relevance to the issue of title between the inheritors or successors to the property of the deceased. Allotment of Plot—Surrender of Plot—Ground Rent—As per surrender policy only 10% of bid amount was to be forfeited-Ground rent deducted by development authority directed to be refunded with interest. Comments Off on Allotment of Plot—Surrender of Plot—Ground Rent—As per surrender policy only 10% of bid amount was to be forfeited-Ground rent deducted by development authority directed to be refunded with interest. GPA was not the beneficiary in any way-He was appointed only to facilitate the proceedings before authorities as he was friend of original allottee and local resident-No consideration ever passed from GPA to allottee-Transaction held to be bonafide-Petitioner held to be bona fide purchaser for consideration-Cancellation order set aside. Comments Off on GPA was not the beneficiary in any way-He was appointed only to facilitate the proceedings before authorities as he was friend of original allottee and local resident-No consideration ever passed from GPA to allottee-Transaction held to be bonafide-Petitioner held to be bona fide purchaser for consideration-Cancellation order set aside. Allotment of Plot—Eligibility—As per scheme applicant should not own any residential plot in his/her name—The expression ‘applicant’ shall also include and represent a ‘spouse’. 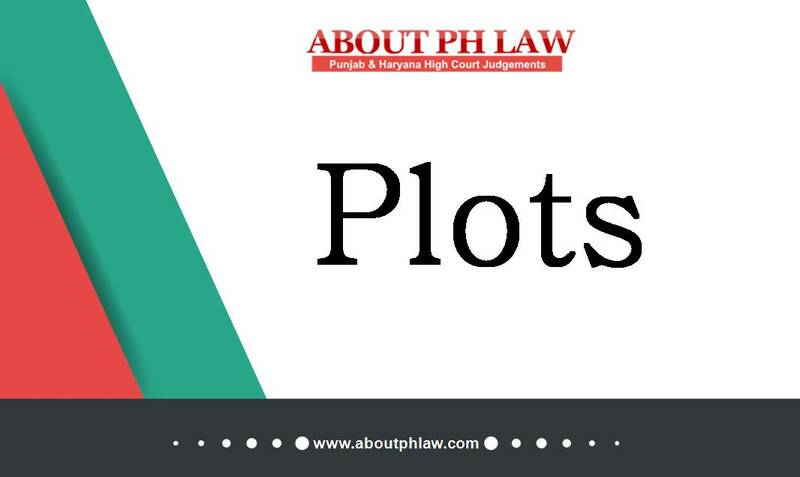 Comments Off on Allotment of Plot—Eligibility—As per scheme applicant should not own any residential plot in his/her name—The expression ‘applicant’ shall also include and represent a ‘spouse’. Intention of Parties—Where there is a dispute on a concept relating to an expression/concept which is not explained in the instrument executed between parties than evidence of the acts done under it is a guide to the intention of the parties, particularly, when acts are done shortly after the date of the instrument. Comments Off on Intention of Parties—Where there is a dispute on a concept relating to an expression/concept which is not explained in the instrument executed between parties than evidence of the acts done under it is a guide to the intention of the parties, particularly, when acts are done shortly after the date of the instrument.